Last week-end fellow painters David Pilgrim and Tim King were staying in Bath. On Saturday I joined them at the preview night of the Gallery LeFort's new show where David has some lovely work on display (and sold two in the first hour!) 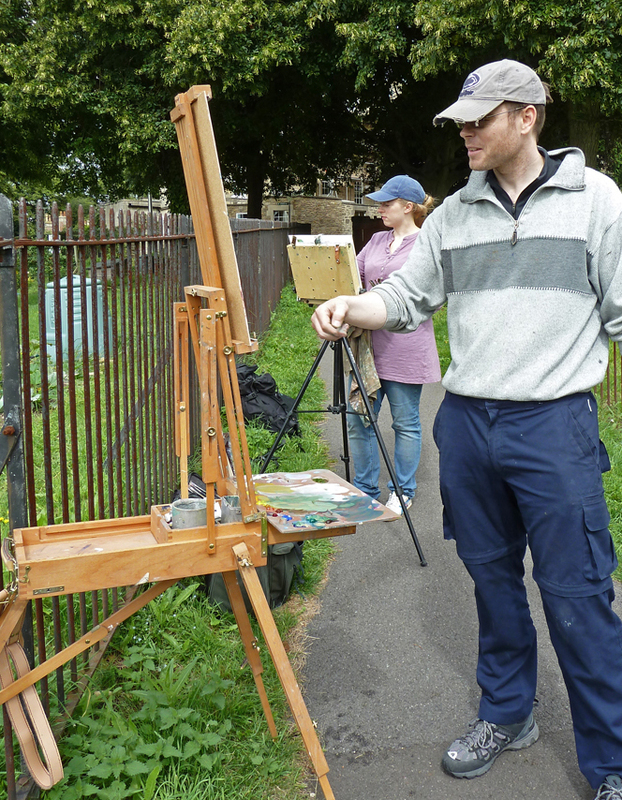 and got a chance to check out some great work from other artists like Peter Wileman and Peter Brown. 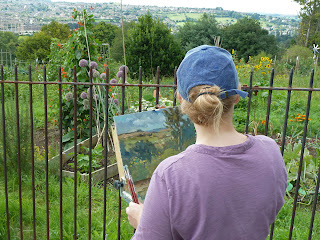 We met the day after for a lovely painting session at the allotments on Sion Hill. I simply can't get enough of the "tree with a view" theme (David calls it with humour "a typical Pirlot subject") and Bath is certainly full of those sceneries. 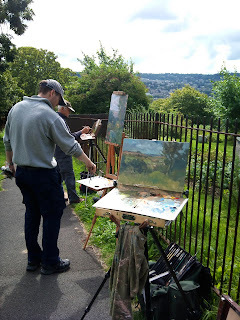 When I arrived on the spot, they both had been painting for an hour already so I really had to go for it and not waste any time (no naps on the grass this time for me then). 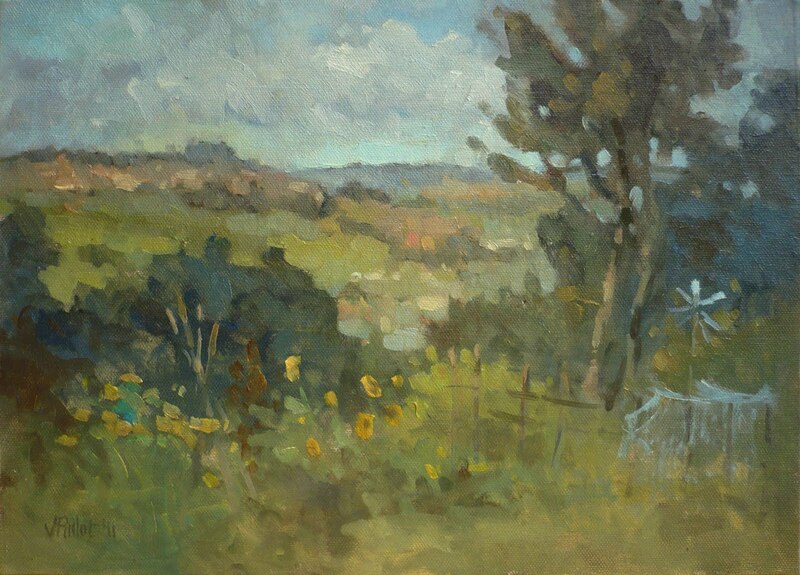 I love those sunflowers Valerie, super painting too (somehow you make it look like Belgium or France). Oh heck! I was invited to the opening at le Forte, but got dates mixed up and double booked so wish I could have been there. I'll have to go along and see the paintings anyway. 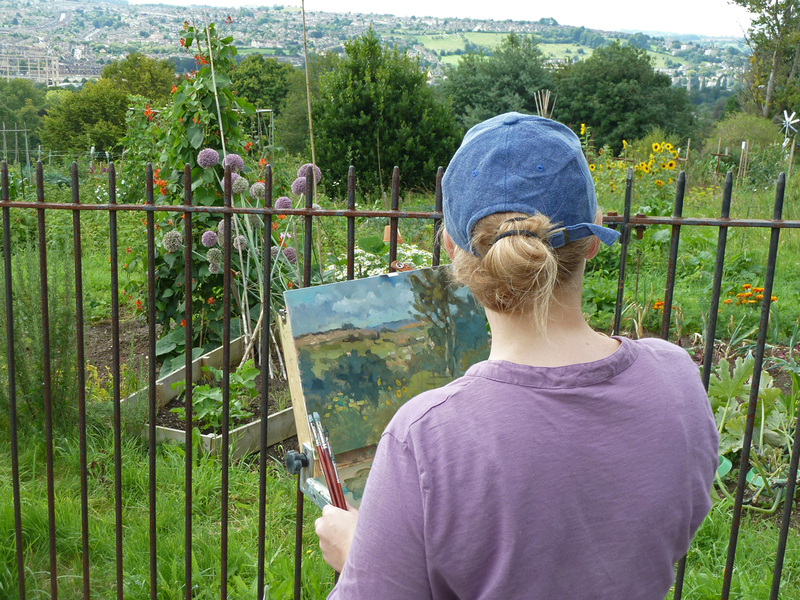 Another beautiful painting, but what is an allotment? 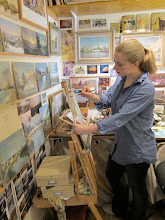 I love how you simplify shapes and colors to really bring a feeling of harmony to all of your paintings. We are expecting another day at 105 degrees.I believe we have had 54 days over a 100 this summer so far, and no end in sight. Our outdoor painting is restricted to the mornings. It looks like you guys had a glorious day. As usual, a beautiful painting. I love your colour scheme, what is your palette? I thought I was happy with mine, but your colours are brilliant. I love the pictures also. They really tell the story. I do look forward to your postings. All the best Valerie. I knew this view had plenty of 'Pirlot potential' and you didn't disappoint :o) The moment I saw it I sensed you were onto a winner. I was convinced the scene would be best served with a long thin portrait format but you somehow picked out a solid composition in landscape format....well worth that little preliminary thumbnail sketch you made just to check the essentials. A nice journey through the landscape to the distant hills with subtle colour balance. I've just started using Burnt umber a fair bit myself.....a lovely mixer and I like the transparaency/consistency of the W&N variety. I love your blog and David's. 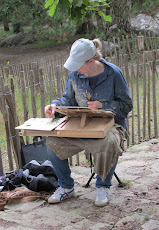 Of course I love to see your art but I also truly enjoy reading about your painting outings and seeing the photos. Can you tell me what Tim's blog is? I tried to find it but couldn't. By the way, allotments= a piece of land made of a group of vegetables/fruits/flowers patches - usually for people who don't have the room to do it in their own garden. Good to see you all working together, I am jealous, I'm yet to have a chance to paint with you. Please book me up in September.